With autumn’s change of season, cooler weather and less daylight, comes a return to living indoors after a summer season celebrating outdoors. Windows are open during the mornings and evenings, to allow autumns’ crisp fresh air to breath new life into our homes, just in time for entertaining and welcoming our fall and holiday guests. Isn’t this a beautiful home, above? It’s from this blog, here. 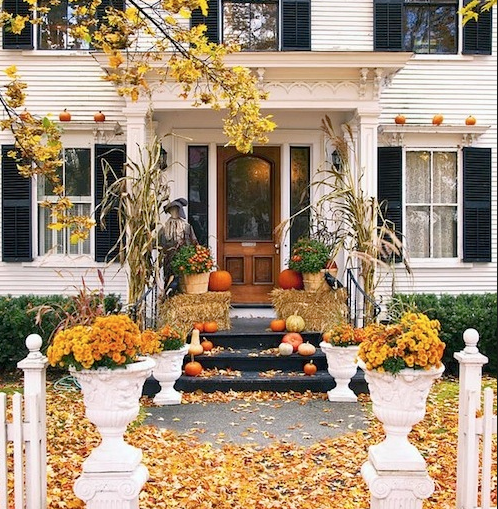 And with more autumn gatherings, with friends and family indoors, comes the need to refresh our home: Stately urns can be elegantly restyled for fall to welcome guests at your entry with loads of mums, guest rooms might be be reappointed with luxury linens to welcome visiting family, and your dining room buffet or foyer table can be elegantly dressed with vignettes including the classic harvest gourd: the pumpkin. Below are a few inspirations for you to consider as you prepare your home to welcome and entertain your guests this fall. To create a simple and elegant harvest vignette to welcome your guests at your entry, opt for creamy and off white gourds. 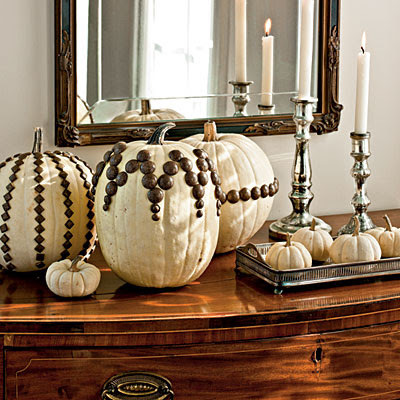 Getting creative with upholstery nailheads can be fun and allows you to create your own timeless look as in this picture below from the October 2011 issue of Southern Living magazine. 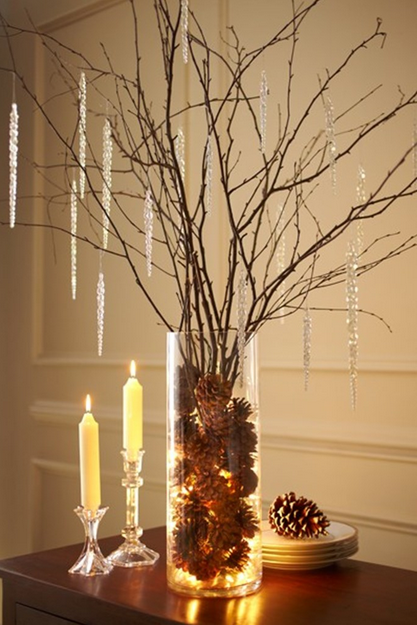 Simple branches in glass vases with pinecones and lit from beneath, also make a statement and add timeless elegance to an entryway vignette. This idea was found, here. 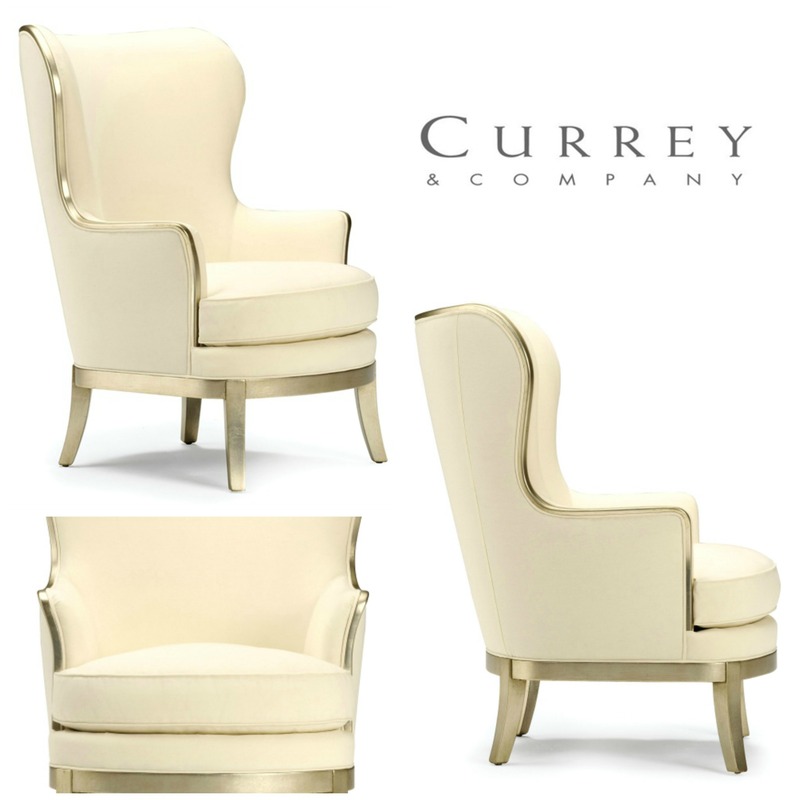 The elegant lines of the Veronica Chair, above, from Currey & Company can create a lovely conversation area in a living room, great room, or bedroom – warmed up by being placed on top of a rug perhaps this one, from Candice Olson’s collection for Surya. With extra guests coming to visit, the need for an additional storage piece in your guest bedroom may be required. 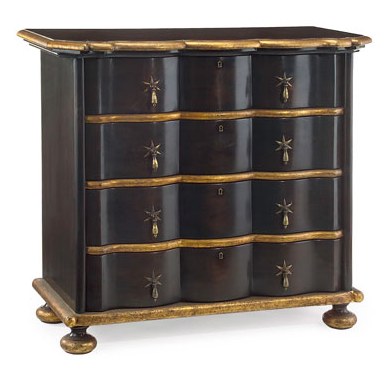 If you live with many neutrals, layering in this beautiful black chest of drawers with its jewelry like hardware from Leslie Hendrix Wood’s #HPMkt sponsor, John Richard Collection, might be perfect. And then you’ll need linens to wrap your guests in luxury for fall entertaining. These are from Peacock Alley, a line we love, not only for their exquisite quality but also for their contributions to Dwell with Dignity, which is kicking off their their annual Thrift Studio pop up shop fundraising event in Dallas tonight, Oct.9th! Find out more about that, here. This favorite of ours, Peacock Alley Braga , above, has beautiful flanged edges with hemstitch detailing and was another “High Point Market “Top Pick“ (from Pulp Design Studios) . 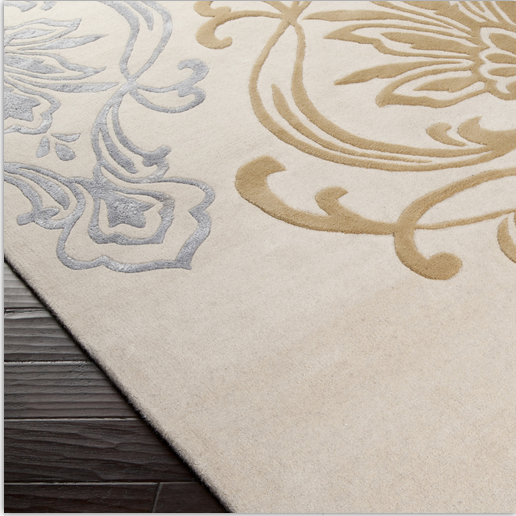 They are 100% linen imported from Portugal, and are available in linen and pearl color choices. And bringing home fresh flowers in autumn colors, to arrange beautifully, are sure to also add a warm smile to guests faces when entertaining in your home this fall. 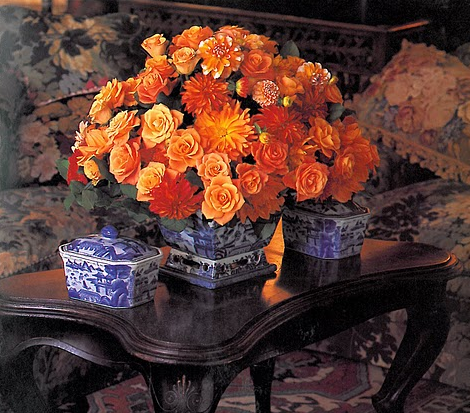 Aren’t these fall flowers, arranged by Carolyne Roehm for her guests, stunning? 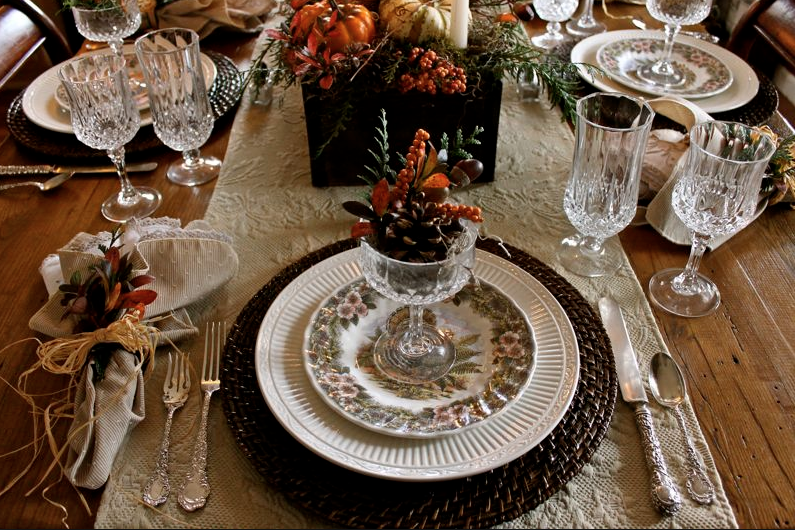 Utilize your fine china and sterling flatware when entertaining for fall. Your guests will appreciate the elegance of a delicious meal, served beautifully, when they’re away from their own homes for the holidays and their children will have a chance to practice their table manners. The children will always remember it, too, especially if there’s beautiful lighting, good conversation and fine music – something they might not be exposed to at home every day during the busy school year. And don’t forget your guest bathrooms. 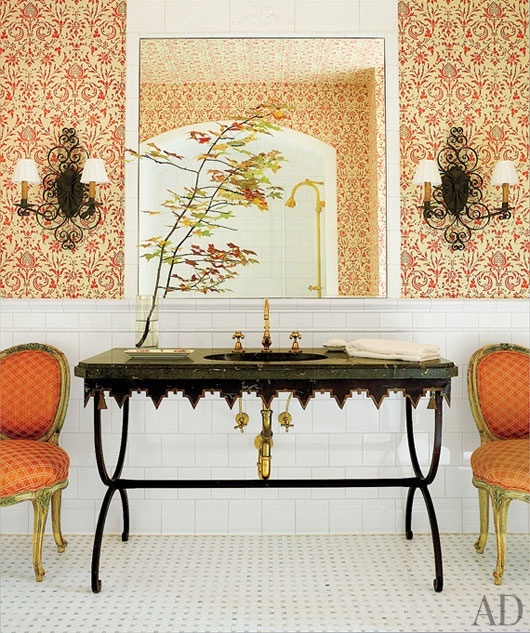 To add height and drama in a guest bathroom room for fall, a single branch of autumn leaves can do the trick, especially on a French sink with marble top, as was done in this Virginia home designed by Bunny Williams and featured in Architectural Digest. Thank you for reading and Happy Autumn Entertaining! Speaking of elegant…have you entered our #TimelessDesign giveaway with Bernhardt for a chance to win their beautiful HAVEN writing desk? You can enter here: https://hadleycourt.com/giveaway and our randomly chosen winner will be announced on October 23rd, the last day of High Point Market. 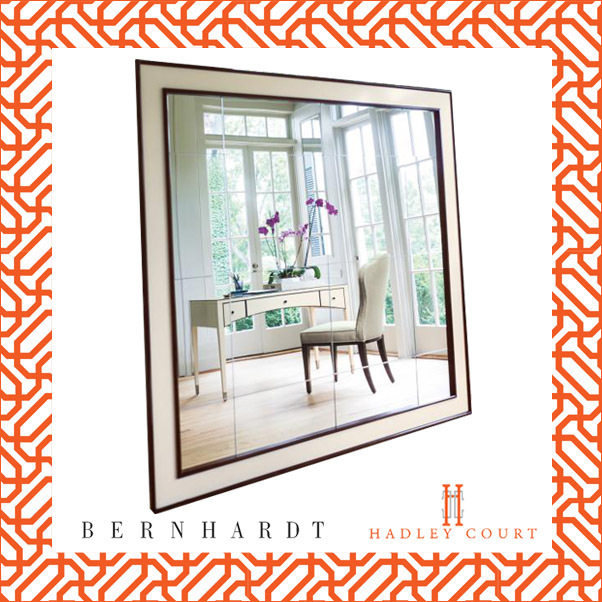 Please visit Bernhardt’s website here and we invite you to follow them on Facebook, Twitter, Pinterest and Instagram. And if you missed our earlier post on Bernhardt’s STORIES OF GIVING initiative to honor 12 of their employees and artisans who are giving back to their local community, please click here. You’re invited to please subscribe to Hadley Court’s blog, here, and to follow Hadley Court on Pinterest, Facebook, G+ and Twitter, here, here, here and here. Thank you, Bernhardt, for making this wonderful giveaway available for our readers and thank you, readers, for visiting, reading and subscribing to Hadley Court!